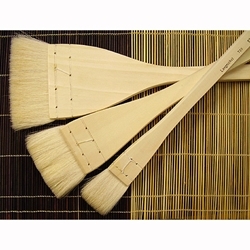 Royal & Langnickel Large Area Brush Set - Three Chinese Hake Brushes - These soft brushes are ideal for laying in large areas of water or watercolor. They can also be used as subtractive tools, for absorbing excess media or "picking up" watercolor or ink. Great for fast and loose painting styles, washes, and laying in background color! The soft, natural hair is glued and then literally stitched right onto the wooden handle. Therefore, these brushes are not meant to be left immersed in water media for long periods of time.